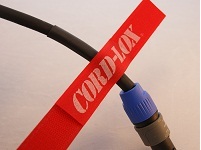 CORD-LOX® can best be described as a line of reusable velcro cable ties. 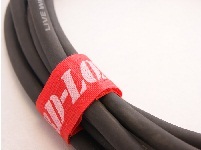 The Rivet Series, Closed Loop, Open Loop, The Buckle & Grommet, The new "Y" series and The Utility straps bundle and provide cable management for everything from delicate CAT 5 fiber optic cable, to heavy duty generator cable. 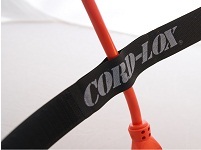 Although cord control was the main objective of these products in the beginning, many other uses have evolved....Air hoses, Garden hoses, welding equipment, jumper cables, luggage tie downs, deck umbrella storage, are but a few of the many products CORD LOX® are used on, If these straps don't solve your cable management or storage needs, we will design one for you. 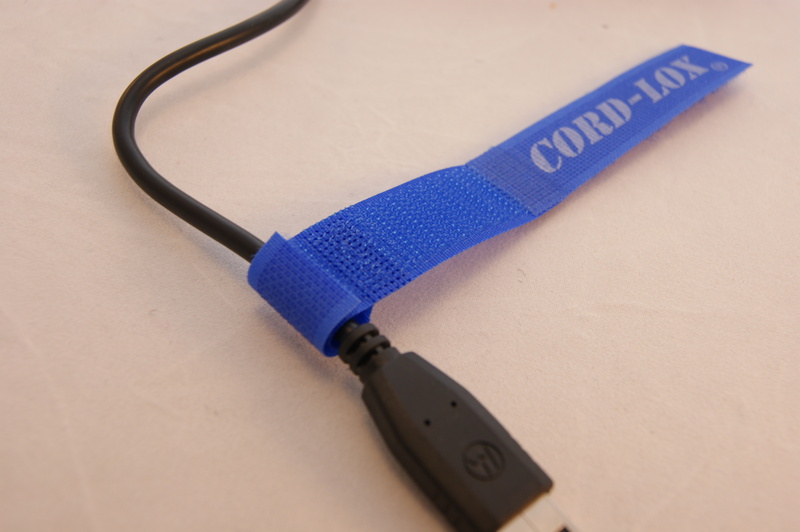 CORD LOX® can be custom printed with your company's name, logo, phone number - any message you prefer. 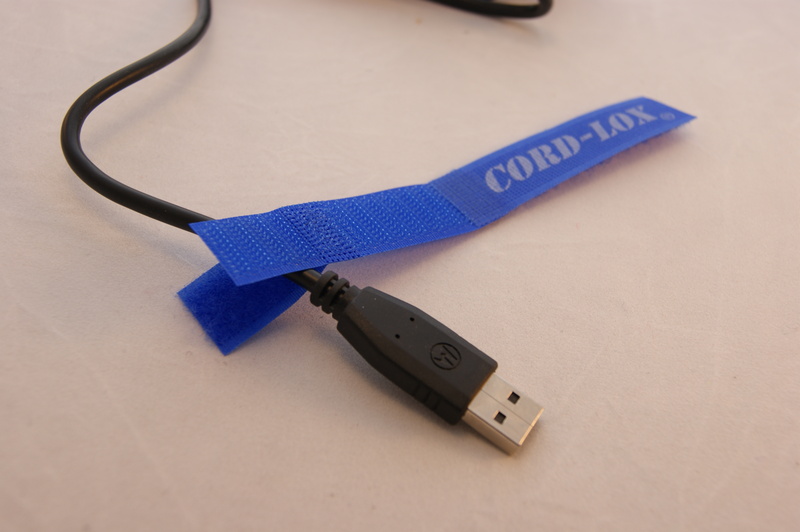 This makes CORD LOX® a functional, promotional and very unique item. You may have seen a CORD LOX® on an iron in a hotel, on a local musicians instrument cable, a giveaway at a Trade Show, this stuff is everywhere! 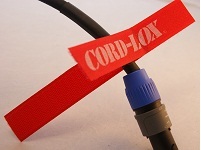 Universities such as Harvard and M.I.T use CORD LOX® to assist in their educational efforts. The VA Regional Offices use these products to help mange files of information for our Veterans everyday. 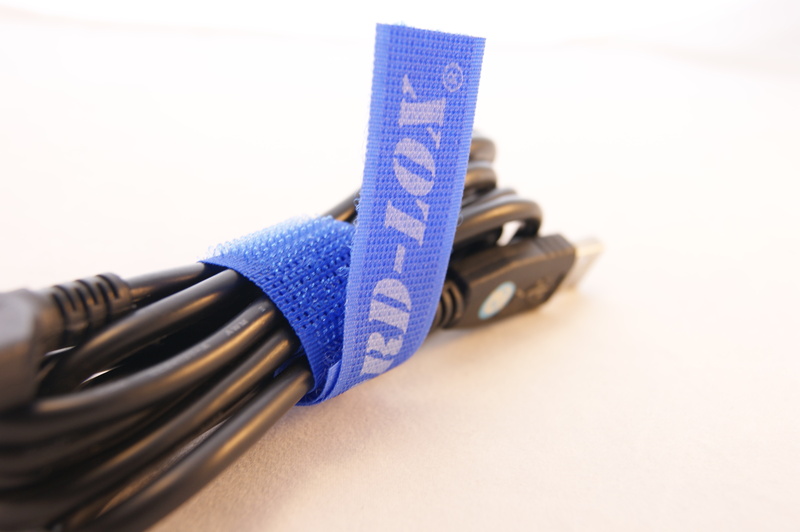 If you are in The Audio Visual Rental Industry, chances are you're using CORD LOX® now. If not, your competition is! 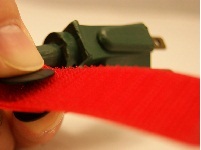 Wrap the strap around the cord with the hook side facing out, aligning the pre-punched holes. Then snap the male and female halves of the rivet together. 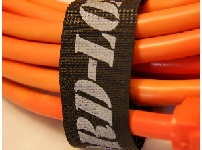 Next, wrap the CORD-LOX® around the coiled cable. 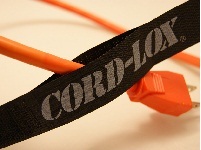 Please note, after the rivets are engaged the CORD-LOX® is considered permanently attached. 206 R 3/4"x 6" 306 R 1" x 6"
309 R 1" x 9" 312 R 1" x 12"
315 R 1" x 15" 318 R 1" x 18"
415 R 1.5" x 15" 420 R 1.5" x 20"
Peel up the non-binded side, place the cable in the opening and press down, then bundle the cable and fold the CORD-LOX® around the bundle. 205 O 3/4" x 5" 307 O 1" x 7"
310 O 1" x 10" 312 O 1" x 12"
412 O 1.5" x 12" 418 O 1.5" x 18"
Insert the cord thru the center loop section, press firmly so the CORD-LOX® stays in place, bundle your cable, then wrap the CORD-LOX® around the cable bundle. 205 C 3/4" x 5" 307 C 1" x 7"
310 C 1" x 10" 312 C 1" x 12"
412 C 1.5" x 12" 418 C 1.5" x 18"
Place cable in the Y section. Mate the Y section together. 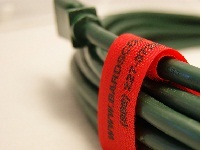 Bundle cable. Wrap the strap around the bundle. 206 Y 3/4" x 6" 208 Y 3/4" x 8"
310 Y 1" x 10" 315 Y 1" x 15"
420 Y 1.5" x 20" 426 Y 1.5" x 26"
Expensive cables should not be left lying around waiting to be stepped on or rolled over. 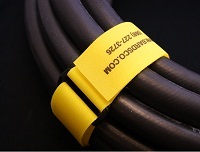 With the Buckle & Grommet series, cords can be stored away safely and efficiently. 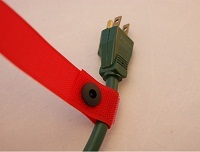 Wrap it around the cord, cinch tight, and hang it up on a peg board or similar fixture, up and out of the way. 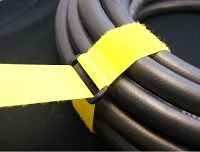 318 BG 1" x 18" 424 BG 1.5" x 24"
Tired of lugging around those bulky, grimy audio snakes or other large cables and hoses that you can never quite get a grip on? Then you'll love our new, improved Coil'n'Carry handle. 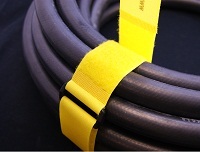 The comfortable rubberized grip is attached to a webbing strap that wraps around a coiled hose or cable up to 9" in diameter. It also has an oversized brass grommet so you can hang it uo and out of the way. The nylon side-release buckle keeps the strap firmly together, yet is easy to adjust and unfasten. 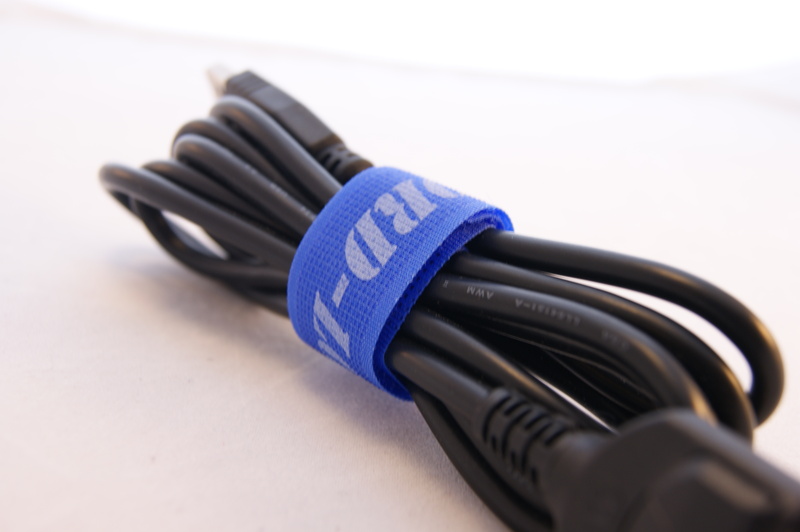 Grab a Coil'n'Carry next time your cords are out of control! Can be built to your specs. 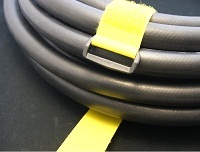 Our Utility straps are adjustable cinch-type fasteners that can be used for a wide array of applications. Wrap the strap around an object, pass the hook/male end thru the buckle, pull tight, then mate the hook/male to the exposed loop/female material. 206 B 3/4" x 6" 208 B 3/4" x 8"
310 B 1" x 10" 315 B 1" x 15"
420 B 1.5" x 20" 426 B 1.5" x 26"